Sony Ericsson's Equinox: Bringing the Flip Phone's Groove Back? Can a $50 flip phone still be fashionable in the touch-screen age? 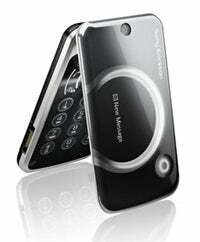 Sony Ericsson hopes so, as it prepares to launch the flashy, but quirky, Equinox cell phone. The Ericsson Equinox goes on sale tomorrow, October 28, exclusively through T-Mobile, and at first glance, you'd think Sony Ericsson missed the memo that Motorola's Razr is no longer the new hotness. Here are the boilerplate features: 2.2-inch QVGA screen, 3.2-megapixel camera, 3G, Bluetooth, and a standard number pad for dialing. But there are a couple nice flourishes, too: Motion controls let you swing the phone to silence calls or alarms, built-in GPS provides turn-by-turn navigation, and an OLED screen on the front signals incoming calls. There's also an FM radio, music playback, a personal organizer, and lighting schemes that you can customize by color. It's no smartphone, but it could be dumber. The look of this thing isn't too bad either, coming in carbon with white trim, and sporting island-style numbers on the pad. It's kind of sporty, which could explain why T-Mobile and Sony Ericsson are hosting a Maria Sharapova look-alike contest in Los Angeles on Halloween to celebrate the Ericsson Equinox. The winner gets a meet-and-greet with the tennis star-slash-model, and T-Mobile's giving away the phone as well. I've happily moved on from clamshells myself and won't go back, but an acquaintance recently put it to me this way: While the latest smartphones require eyes on the screen, it's satisfyingly effortless to flip open a clamshell and start talking.